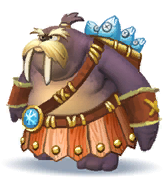 Chum Chucker Charlies are enemies appearing in Donkey Kong Country: Tropical Freeze. They are Waldoughs and have a purple skin, a leather sash, a timber skirt with a pair of brown and red striped trousers underneath, two wristbands, and a basket of fish on their back. 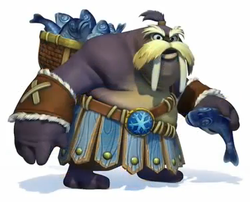 As implied by their names, Chum Chucker Charlies attack by hurling fish in the direction of the Kongs. These fish slowly arc through the air before ploughing on the ground, disappearing, and must be avoided. Chum Chucker Charlies are also able to damage the Kongs directly if they bump into one. However, they can be defeated if stomped on three times, or if rolled into the same amount of times. They can be instantly defeated if the Kongs throw a barrel at it, or by using Rambi's Horn Attack. This page was last edited on February 27, 2019, at 01:48.